The European target value for the protection of human health is based on the daily maximum 8-hour mean ozone concentration. Averaged over 3 years, this daily maximum 8-hour mean should not exceed 120 μg/m³ more than 25 times a year. This European target value is a medium-term objective (MTO) and applies since 2010 (average 2010-2012). The long-term objective (LTO) is not a single day with maximum 8-hour means above 120 μg/m³. This indicator is expressed as the NET60 indicator (Number of Exceedances above a Threshold of 60ppb (=120 µg/m³)). The figure below uses box plots to show the evolution of the minimum, the 25th percentile (P25), the 50th percentile (P50), the 75th percentile (P75) and the maximum number of days with a maximum 8-hour mean concentration above 120 μg/m³ reached in Belgium. The evolution of the number of days with the maximum 8-hour mean ozone concentration above 120 μg/m³ shows a strong variation from year to year, depending on the quality of the summer. No clear trend is apparent in the spatial average. 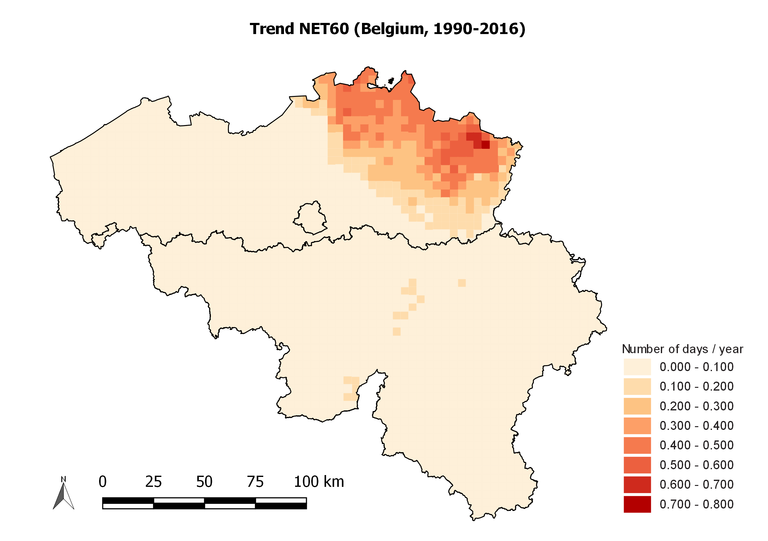 The most unfavourable ozone year since 1990 is 2003 with a maximum of 65 exceedances somewhere in Belgium. 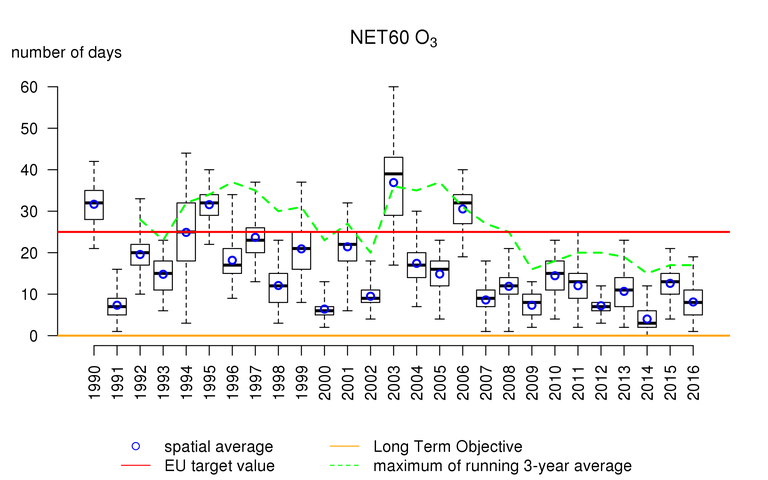 Since 2007, we have had relatively favourable ozone years, which explains why in recent years the 3-year average has remained below the European target value of 25 days. The figure below geographically represents the trend of the number of days with maximum 8-hour mean ozone concentration >120μg/m³ during the period 1990-2016. In this period, there has been a (near) status quo most of the country, the exception being the est of Flanders, where an increase of up to 0.8 more exceedance days per year can be observed. Trend (number of days/year) of the number of days with maximum 8-hour mean ozone concentration above 120 μg/m³ (NET60) over the period 1990-2016. All data were calculated using the RIO interpolation technique.